On a whim, I decided to head up to Corona and investigate a trail I have l been eyeing for a year or so. To get there I needed to climb the Skyline Drive Fireroad on the the northeast side of the Santa Ana Mountains. I arrived at the trailhead at fairly descent time and since this was an on-a-whim ride, I was joined by all of my friends. The temps were pretty nice as I started my solo climb up the fireroad. While the grade did not seem steep, I was surprised how quickly the elevation stacked up. There were some nice views to the north despite the ickyness that was setting down in the valleys below (That is not fog). The climb went by quicker than expected and I even got a really cool treat. I rounded a corner to see a young bobcat crossing the fireroad. The cat was not much bigger than your average house kitty. He climbed up a steep embackment and stood at the top looking down at me for a good 15-20 seconds. I was trying to get my camera out without causing him to bolt, but as soon as he saw the camera come out of the bag and me start to raise it, he stepped into the brush. Geez, he was pretty. It was awesome to get to admire one of these critters up close. It was not long after this encounter that I made it to Beek’s Place and continued along Main Divide past the golfball. I have been tinkering with a new helmet camera mounting setup that would allow to get away from having a dedicated helmet for the camera system. Wearing the helmet camera on long climbs when you are not filming is a bummer. I want to be able to quickly remove the camera gear so that I could only carry a single helmet on a ride. The new setup basically uses the quick-release mounts designed for professional/prosumer grade camera tripods. When completed this setup should be must more versatile. So far I have only completed my full-face helmet. That was also part of the reason I chose this trail, it seemed silly to bring a full-face helmetcam out to some place like Penasquitos Canyon. After about a mile of climbing on Main Divide Truck Trail, I reached the “Skyline DH” (Have no idea what it’s actual name is yet). I was looking at this ridgeline quite a bit on the climb up and it certainly looked to have some steepness. Steepness it did have. While this trail felt a little like Bell Ridge at the beginning it soon became much more like Coldwater. These types of trails are somewhat of an acquired taste. There were some sections of pure adrenaline rush as you just flew down the trail. Other sections were so so steep that you had to be somewhat surgical with controlling your bike and the brakes as you could only marginally control your rate of acceleration let alone stop. I like sections like that for the challenge they present but they are not my favorites. As I neared the bottom, I came upon a firecrew contracted out from Oregon to do some debrushing for fire abatement on the trail. They were doing a fine job, but since I caught them in mid-workday, they had yet to remove all the trimmings from the trail below them. This made the last bit of descent slow going but overall this ride was well worth it. FORWARD: This is repost of an online post I made in September of 2007 after my boys and I spent a weekend camping in the Laguna Mountains. I am in the process of updating my page and maps on the area. While doing this I noticed I did not have this story anywhere on my site. This post here is designed to “capture” the story within my site. Me and my boys are in between thier youth hockey seasons right now so we took advantage of one of the free weekends to get in a little camping and riding in the Laguna Mountains. While the biking was not the primary goal for the weekend we had a lot of fun and I am quickly starting to get a couple little dirt addicts on my hands. We got to the Laguna campground late in the afternoon Friday and just did get setup before dark. Saturday morning we took a spin around the Big Laguna Trail. The BLT is a great place to take kids that are looking for a “big” ride. My youngest Jake was getting a bit bounced around on the uphills with rocks so we stopped and did some sessioning on how to unload the front wheel when going over the stuff. He picked it up really quick and owned the stuff the rest of the morning. By 1PM we were out on nearby Lake Cuyamaca fishing. The keyword is Fishing NOT catching. So it was Chicken for dinner that night. The rest of the evening we spent screwing around with the fire, smores, and flaming balls of marshmellow goo. The next morning we decided to do the BLT in the other direction this time. Jake’s handiwork with the camera. And Will messing with the camera around camp. After the ride, we took our time breaking down camp and where rolling towards home by 1:30pm. It was a great weekend with the boys and if you are ever looking for a good place to take your kids beyond the local parks this place is pretty good in my book. So the plan for today was to hit up some Santa Ana Mountains Fireroad Up Singletack down action. One phone call from a total stranger yeseterday afternoon changed those plans. The stranger in question was the manager of a gas station a few miles from house. My oldest son, Will, had gone skating with some of his friends and something had gone wrong. The paramedics had already been called and all the guy would say that he had really hurt his right hand. When I arrived the local fire department paramedics were already on the scene and had loosely wrapped up his thumb in what had already become a blood soaked cloth. They advised me that they could save me a lot of money if I drove him to the ER myself, but his hand needed to be looked at right away. So before long we were at the ER. At this point I had not seen the wound yet but I was worried as Will said it was sorta numb. When the assessing nurse took of the dressing to get a look it as we were dealing with it was all I could do not to openingly freak out. Parents are meant to see their childrens’ bones. But there it was, back to the first knuckle was flayed open with the nail off to the side and the skin and muscle off to the other side with the bone showing. Our time spent in the waiting room was exactly zero seconds as we were whisked off to X-Ray and then Orthopedtics. Will was a popular guy as many folks came by for a look. It did not take long for the doctors to make the call to bring in a hand-surgeon. There was going to be a delay in the specialist arriving so in addition to the normal pre-surgery stuff, “Dr. Feelgood” made a visit and gave Will some Morphine. Will was giggly happy for quite sometime before doozing off. So the hand-surgeon arrives and within an hour Will is in the operating room to have his thumb “repaired”. That term seemed odd to hear as I expected something like sutured or set. Repaired just seem so serious. After a long couple of hours, he was out of surgery and off to the recovery room. The surgeon seems to think that it should heal up just fine. He was kept overnight and released this morning. He will be back to the the doc again in a few days to see how the healing is going and to see where to go from there. Geez, you only wish for the best for your kids and it hurts to seem them hurt. Will will be taking a break from Hockey, Biking, Skating Boarding and the Electric Guitar for a bit. School work should be a little interesting as well since he is right-handed. Of course like father like son there was a video camera on the scene. My bet is that his buddies will soon have it YouTubed. “I forgot my camelbak.” That is how this tale of forgetfulness, epic trails, conditions and people starts. My buddy Bill O’neil had never ridden Noble Canyon out in East County San Diego. 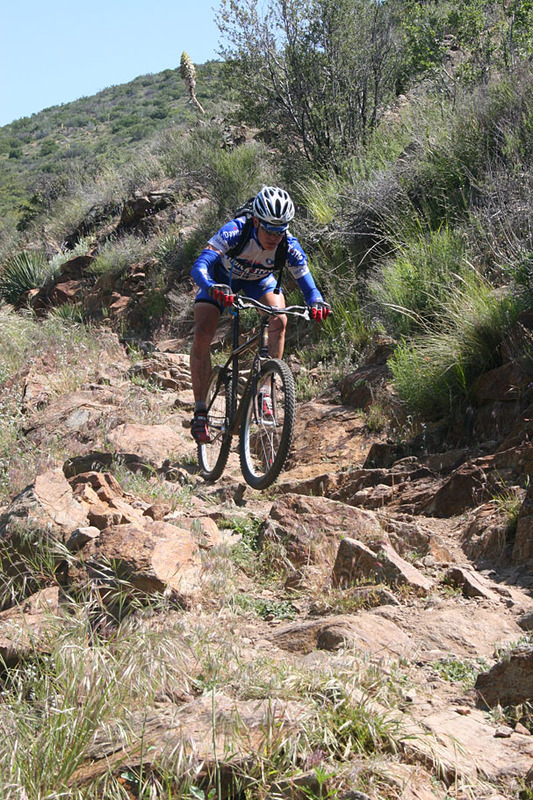 Noble Canyon is designationed a National Recreation Trail and is one of the IMBA Epic Trails. If you live in Southern California is basically considered a must do. So Bill was on his way down to my house from LA on Saturday. The plan was to hang out on Saturday and then ride on Sunday. Bill called me when he was halfway to my house when he realized that he had forgotten his camelbak. This was no big deal as I had spare smaller 70oz camelbak that would work. So Bill gets down to my house and as he is always good for, he brought some might tasty beverages and spirits along with him. We ended spending the evening enjoying them while tinkering with bikes. Bill is also a pretty accomplished quitar player so there was also a bit of jamming going on with my boys as both of them have recently picked up the quitar. It did not take long for my boys to be give Bill the Wayne’s World “Were not worthy” salute. It was a bunch of fun. When the lights finally went out in the house, I had no problems falling asleep. The next morning came pretty quickly and I found myself just a little “foggy”. We were not doing the full “Tour de Noble” today. 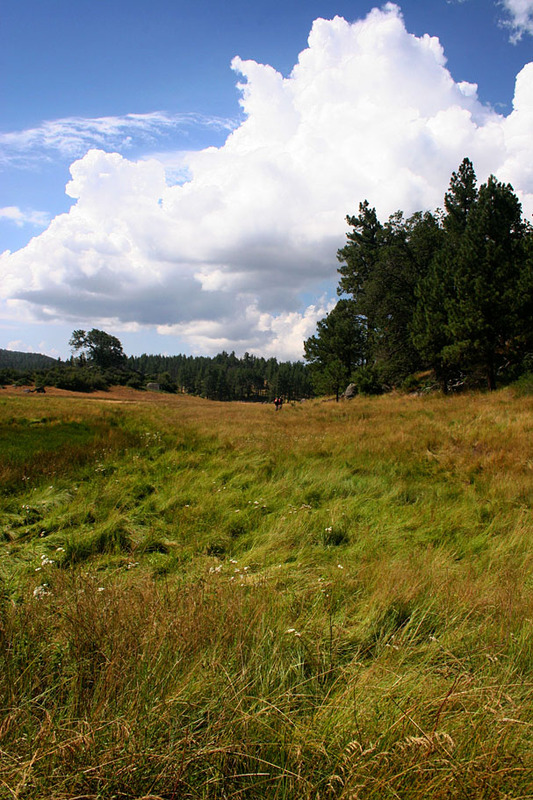 We were doing a point-to-point that included Noble, the Big Laguna Trail (BLT) and the Laguna Mountains. So this meant two trucks. As I packed all the stuff into the truck I ran through the mental checklist: Bike, Shoes, Clothes, Helmet, Gloves, Glasses — CHECK! Off we went. The weather had made a dramatic turn over night as a storm had moved in and there were had been some intermittent rain overnight and the skys look somewhat menacing but with hope of blue on the horizon. The Lagunas are a long way from North County San Diego so the thinking was that the weather might be different at the trailhead. On the drive out, I had resigned to the fact that we would most likely get rained on at some point during the day, but we had a good chance for some incredible conditions. Once at the upper trailhead at the RedtailRoost Volunteer Center off of Sunrise Highway it was pretty cold at 39 degrees and and breezy. My trusty windbreaker was (you guessed it) in my Camelbak. My garb for the days was shorts, knee warmers, long sleeve jersey with a short sleeve jersey on top and a pair of wind-proof winter gloves. Being in the clouds of a brewing storm was pretty interesting as you had what looked like fog but you also had the whipping breeze that had a primordial type of feeling as forest just sort of disappeared into a gray but shifting nothingness as the different densities of the clouds would pass by. The opening section of trail was really cool as the moisture from the night before (or maybe even minutes before we arrived) had patted down the trail enough to make for perfect traction. It was fast rolling and gripped in the corners at near velcro strength. After a good bit of ridge riding that was mostly downhill we connected up with the Aqua Dulce fireroad and climbed up to the top of Los Gatos Ravine for one of my favorite singletrack descent into Big Laguna Meadow. It has wonderful flow and enough grade to keep you ripping along with little in the way of pedal action if you just want to cruise. Once we got out onto the meadow, we were smacked with the full force of the wind and for some period of time it was just hunker down and keep mashing the pedals to keep moving forward, Since the wind was mostly blowing from the south, once we got on the south side of the meadow we gained a little shelter from the breeze. At this point we were both pretty stoked not to have gotten rained on yet. We were making pretty good time as moving meant generating warmth and rest meant loosing warmth. We soon made our way to the far end of the meadow and onto the connector to upper Noble Canyon trailhead. While grabbing a quick snack at the top of Noble we encountered our first bit of snow. It was just a few flakes here and there but it was indeed snow. We were soon on our way down the Noble Canyon trail. We were not on the trail more than five minutes when the wind got to howling pretty hard and I thought I was getting sand blown into my eyes. The problem was that there was no sand nearby. After a minute or so I figured out the stuff pelting me was not sand my but very small bits of sleet. Besides the slight stinging that the sleet gave when hitting you at speed, it was not bad as it mostly bounced off so my clothes were not getting soaked. The sleet only lasted for a few sessions of a minute or two at a time. Once we dropped a little elevation we got down below the clouds that were producing all the wind and things became pretty calm in comparision. Noble Canyon was freaking great as always and the overnight moisture made for a ripping good time. I was throughly enjoying showing off some of my home turf. I ran into one of my local riding friends who was riding up Noble while we descended. He had forgotten his trail grub and was planning on cutting the ride short. We hooked him up with enough snacks to keep him going. We both thought that after all of the generosity our three buds at the bottom had show us it was the least we could do. It was shortly before the “Stairway to Hell” that the help of the buds at the bottom became pretty important as Bill got a flat. Luckily we had that pump and tube to get us going again. While changing the tube it started to rain. While it was cold and biting we were both pretty stoked at this point as we had fully expected to be rained on hours ago. Once we got rolling again it was time for the “Stairway to Hell”. It is a technical challenge of jumbled rocks without a line per se, more like a general direction to go, and it was wet. On the first attempt, the tires were somewhat doing thier own thing on the wet rocks and it gave me the hebegeebees enough that I lost my momentum. The second time was a charm as I trusted the bike and tires to make thier own “adjustments” properly if I kept the speed up. By the time we got to the longest and last climb of Noble Canyon a somewhat steady but very light rain had settled in. The good news was that we were climbing so it was easy to keep warm by burning calories. As luck would have it the rain let up when we reached the top of the climb. The last technical bit down to the lower trailhead (known as extra credit) has always been one of my favorites and it did not disappoint. Over mexician food in Alpine with some fellow MTBers coming in from another ride, we recounted the day’s adventure. The trail was only a portion of what made the story an epic. The trail conditions certainly played a major portion of the story, but I say it was the awesomeness of my fellow MTB junkies that made the day great. Without the help of five strangers, this would have been a pretty miserable day. I hope many days of good Karma come to these five guys. Instead this day being a disaster, is destined to be recounted numerous times over fine whiskey or tasty microbrews. So while 80% percent of the country was out doing the election day thing, I (thanks to the CA mail-in ballot program) had time to get in an afternoon ride (or two). The day started off with a couple hours of light rain which we really needed here in SoCal. Most places around San Diego are not real rain-friendly as our soils typically do not handle traffic well when wet. Elfin Forest usually handles rain well so I opted to give it a try. I always enjoy the beat down “The Way Up” trail puts on me. Ouch, Ouch, Ouch, You Fat Freaking Slug, were common sounds rolling out of my melon on this climb. What was really cool, was that the parking lot was empty when I started and I was the only tracks (be it foot, tire, or hoof) on the trail for the day. The rain had knocked down all the dust and the trail had perfect traction. After finally getting to top of The Way Up trail, I hit the Equine Incline Loop. Oh My what fun all this traction was in the turns. As anybody who has done this loop before will tell you, no matter which way you do the loop it is fun, but you have to climb back out. There was more grunting an growning on my part. I hit the rest of the singletracks out there like Tike’s Hike, Quail and the Hodges Overlook. On my way out to the Hodges Overlook I had an interesting view of the reservoir and the Pacific Ocean in the distance where the two seemed to be nearly joined. The view from the Hodges Overlook was particularly nice today as thier were lots of puffy clouds around to make for an interesting sky. On my way back from the Overlook I passed another rider. Shortly thereafter I was heading down The Way Up trail. Now there was only two sets of tracks on the trail mine and the other riders. 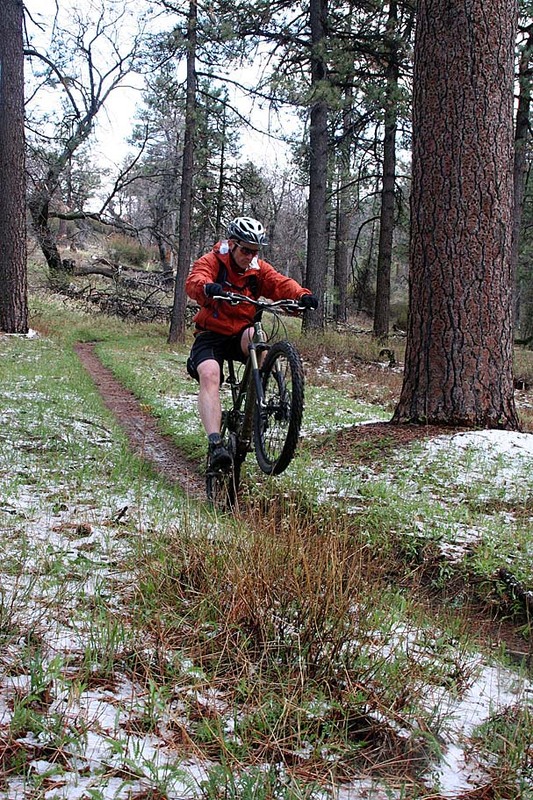 The moisture on the trail make the tracksl easy to see and it was interesting to see the different riding styles. 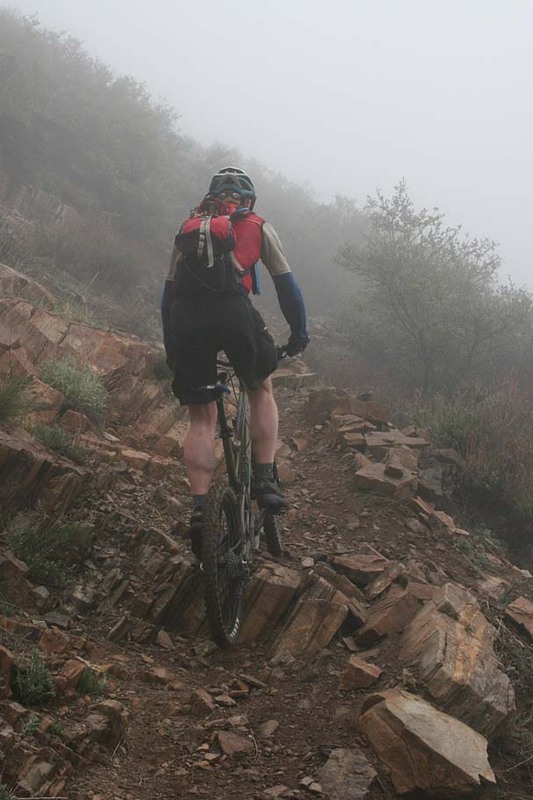 The other guy was on a very light looking hardtail with skinny tires while I was on my all-mountain rig with fat 2.6s. I could see where he was picking the most elegant cleanest part of the climb, I on the other hand was taking a more “Bull in a China Shop” type approach. Over course I saw a few of my own foot prints while nothing from the other guy. 🙂 So now I am thinking this guy is going to be looking at my tracks on the way down. I certainly did not do anything impressive on the climb so I thought I better make up for it on the way down. I made a point to take the hardest line doable on the descent and boy was it fun. There was at least a couple of spots where I thought, okay Mr Fancy Pants climber follow THAT one. So before you know it I was back in the parking lot and headed home, there was a descent amount of daylight left so on a whim, I swung by La Costa to squeak in a loop. I parked and within 2 minutes, I was rolling. Up Vista Del Mar and down Switchbacks was the plan. I typically like going down NASCAR, but I had not enjoyed the cruiser style descent that Switchbacks provides in quite sometime. I made it to the kiosk at the top just in time to watch the sun set on the Pacific. The Switchbacks descent was really fun and the traction once again was good, but La Costa did not seem to benefit as much from the light rain as Elfin. It was a great way to finish off and afternoon of riding. – The power of stupid people in large numbers. 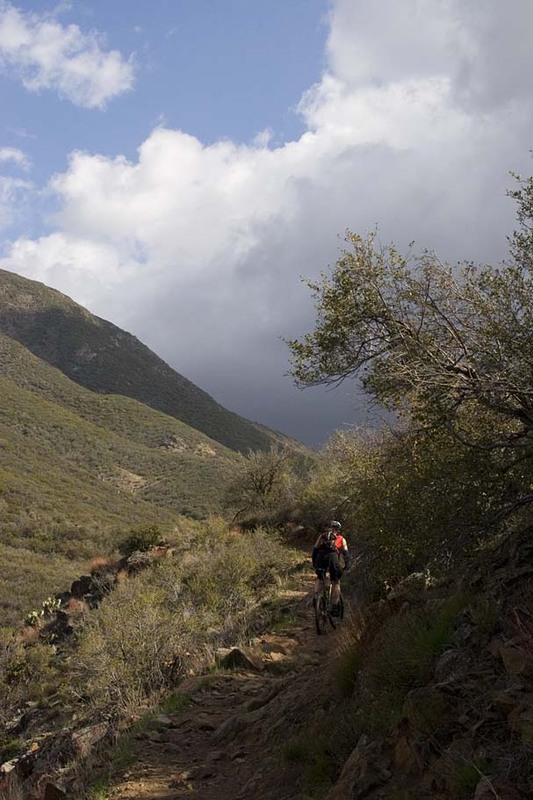 During this past week, I took a “personal day” from work and headed out to the Laguna Mountains for a day on the bike. I have ridden the Big Laguna Trail (aka “BLT”) lots of times but never really all the stuff at once. The BLT has always been inconjuction with something else like a camping trip with the boys, the Single Speed Summit, or part of the “Tour De Noble”. Either way I have done the various part but not all of it at once. Today I was going to put all the pieces together. I left mighty early from home at my usual heading off to work time. Right off the bat it felt great to make that first left when I usually go right. The drive was great. I felt like an enlighted lemmin heading towards a hills, while the rest of the world marched towards the 9-to-5 cliff in their shiny metal boxes. (Yes, I am a Police Fan). I watched to the sun break over my destination in the distance. I was enjoying a cup of coffee like I always do in the mornings. This cup used the same grounds, water and machine as yesterday, but it just seemed to taste better when facing east and away from the city. When I arrived at the trailhead at the Meadows Information Kiosk east of Big Laguna Meadow, it was a glorious morning with a slight crispness to the air with the smell sound of autumn as a slight breeze rustled through the trees that still head most of thier leaves. Heading out on the trail it was obvious that I have been slacking on the bike as of late. I really did not care at this point as I had the whole day and I was out myself. This was not to be a training ride, this was about “Just Riding”. All throughout the day, I took all the forks in the trails that I normally don’t take. I went up trails I know are best done the other direction, but hey, I wanted to see what was at the top. I focused on the all the upper trails to the east- northeast of the meadow to start with before venturing down to the meadow. I would end making a couple trips down to the meadows just to catch the next spur trail that heads uphill and away from the meadow. I would only see a couple of bikers and a hiker over the course of the day and it was just perfect. I felt so alive and revived during this ride. It is funny how therapuetic the sound leaves crackling under your tires and a cool breeze on you face can be. This ride was an MTB version of a Day Spa and it was just what the doctor ordered.